In many spiritual traditions the spiral is considered a sacred symbol of the soul’s eternal nature. Megalithic and Neolithic cultures all over the globe used spirals in their art, and some of the best examples can still be seen throughout Celtic Europe, such as the entrance tomb of the Newgrange monument in Ireland. Made from copper, a stimulating metal in magical theory, this pretty spiral garden charm is meant to promote the growth and health of your plants. Hang it from a tree or large shrub where the breeze can blow it gently and encourage the beads sparkle in the sun. If a particular plant is looking pale, hang the charm from or near it and see if it revives! Or simply enjoy the craft for what it is, a bit of whimsy to add beauty to your garden. Cut one 6-inch and one 5 ½-foot length of wire. With your needle-nose pliers, twist a small spiral into the end of the longest piece of wire, approximately ½-inch in diameter. Select an assortment of beads that look good together. Random patterns are typically more attractive when the colors are harmonious. For this project I choose beads in clear glass and subtle earth tones. 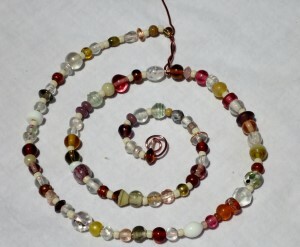 Thread your beads onto the wire in a random pattern, pushing them to the end with the small spiral. When you’ve beaded approximately 24 inches of wire, begin shaping it into a spiral. Continue until you have a beaded spiral approximately 6 inches in diameter; it needs to fit into the hoop when finished. For stability, loop the end of the wire down to the proceeding row of the spiral. Fit the wire between two beads and bend it back up to form a support structure between the two outer rows. Without support the spiral won’t maintain its shape when hung. Wrap the wire around the copper hoop twice to secure the spiral to it. Form a loop at the top of the hoop to use as a hanger. Twist the wire to tighten the fixture securely. At this point you’ll have approximately 2 feet of extra wire. Do not cut it off. Use your needle-nose pliers to make a small spiral on the end of the 6-inch piece of wire. 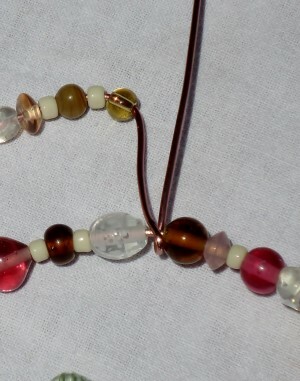 String an accent bead or two onto wire. Fold the straight end of the wire over the copper hoop directly across from the display loop. Wrap the wire around the hoop once or twice, twist to secure and form any extra wire into a small decorative spiral. Bend the extra wire from the top and begin carefully wrapping it around the hoop for a design accent. This wire won’t be structural but will add another layer of interest. Keep wrapping until you’ve made a complete circle. 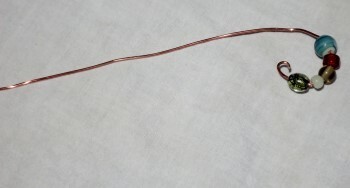 Cut off any remaining wire or shape it into a small spiral. Don’t panic if your center spiral gets pulled slightly out of shape. You can perfect it again before displaying.